На сайті з 11 липня 2018 р.
Hi! I'm a professional photographer and retoucher. I've been working in this field for 4 years, approximately. During this time stands out my participation with a photography team where we were responsible of the shoting of several catalogs for one of the most reputable jewelry brands in Argentina. Also, I've been in charge of the photo editing in the last 3 catalogs. This experience has led me to get in touch and colaborate with many others professionals. Besides product photography, I've been working in fashion, advertisement, family portrait, newborn and maternity photography, etc. I'm very confident and I have a lot of experience working with Adobe Photoshop and Adobe Photoshop Lightroom. 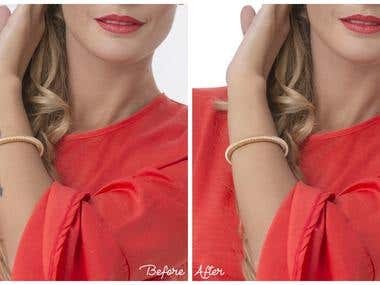 I can help you with: - Photo collages - Portrait retouching - Correction of body contours - Color correction - Removal of unnecessary objects - Converting from RAW format. - Creating HDR images If you have any question, do not hesitate to contact me. Cheers!